Our first hermit crab that my son picked out at the beach has been down molting for a long time and I'm really starting to worry. Fluffy is a medium PP and has been down 51 days at this point. He had a successful molt with us back in August/Sept and that one was 35 days. I had another medium PP come up from a successful molt on 12/24 since Fluffy dug down. That one stayed down 47 days (which was a big jump from it's earlier 26 day molt). I also have a small PP molting in the same tank that's been down for 29 days at this point. I have noticed that all of them are staying down longer during the winter molt, maybe because the tanks are a few degrees cooler. Is this abnormally long? When do I start digging and hoping I don't find bad news? Update: The 10 gallon is on a nightstand and on a towel so I had my husband slide the tank so I could see the bottom of the tank under one end (and he held it so it didn't drop on my head hh). I could see from under the tank that there is a partial window and there was movement when I shined a light. The "window" wasn't very open so I couldn't see for sure who it is, but the area was about 2" in diameter. Fluffy is a good sized medium and Flash is a teeny/small. Based on the size of the window it had to be Fluffy. So, at least I have hope that he will be ok since he moved! Sometimes I think the length of time they stay down depends on both conditions and the crab's individual personalities. Mine all seem to molt really fast. My smalls go about 10 days and Godzilla ( a smaller large) took about 6 weeks whereas Gamera ( a bigger large than Z) was down 2 months, got dug up for a sub change (he had an entire leg to regrow), pulled a surface molt about 10 days later and was done in about a week, new leg and all, so I think it just depends. Seeing that movement is definitely hopeful and if your guys have a history of long molts, they are probably okay. did you take the crab from the beach? No, we bought it at one of the beach shops. 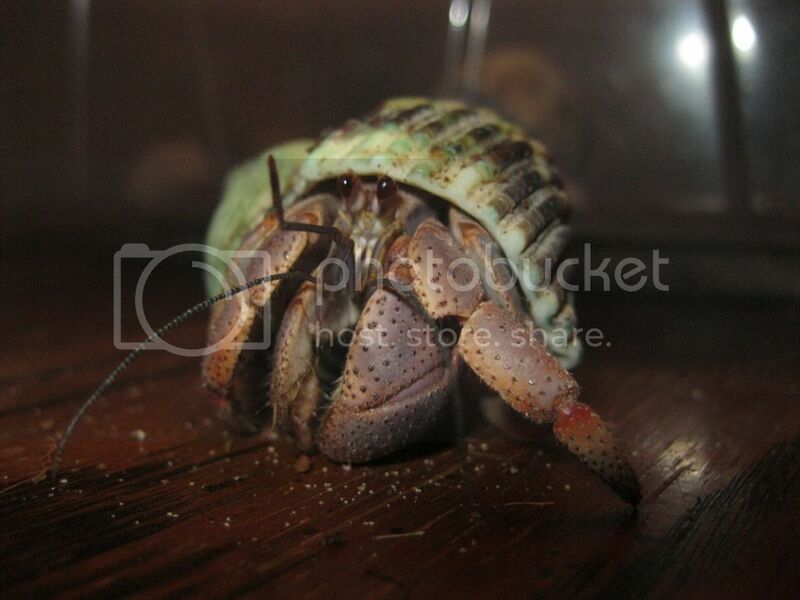 At 2 AM this morning I woke to the familiar sound of hermit crab shell against glass. The 10 gallon is still setting in the bedroom from when we did the painting a while back because I didn't want to move it with molters. Fluffy came up after 54 days! This morning he was dug back down in another part of the tank (found freshly dug up sand). I didn't get a good look when I checked in the tank at 2 so I'm hoping he comes back out tonight at an earlier time so I can see how he looks. Congrats! He probably knows you want to see him so he is being as elusive as crably possible. That is great news! HH, good one Meg! Crabbily possible, he he. So now I'm starting to worry again. I'm new enough at this (7 months) and haven't had enough molts that I'm not sure if this is normal. Fluffy came up in the middle of the night on the 24th, was up at least a few hours (heard him 2 hours later), didn't look like he had touched the fresh food, but may have hit the dry dish with the oyster shells, mineral blend, and protein suppliment. Then he dug back down on the opposite side of the tank and apparently hasn't been back up. I never got a good look at him because it was a) 2:00 AM when he woke me out of a sound sleep and b) the night glo light isn't very bright. Should I be concerned? Is there anything I should do? Okay, first, don't sweat it. It doesn't matter how long you've been at it,molting time is always stressful-ask the longtimers, hh. Yeah....they'll do that, hh. It's also these moments that you start understanding why some people have 50 crabs! They have a better chance of not having everyone down at once. I often wonder if they know each other is down under the sub when they are on the surface. I only have two who have been out lately and I wonder if they get lonely. It's best to not disturb their tunnels, but all is probably find. Depending on the size of your crab it could stay down for a couple weeks or a couple months. I just had a teeny/small that came up after 59 days, which is a long time for that size. Keep your conditions good and make sure you are feeding lots of protein to the crabs that are still up so that they don't feel the need to go digging for the molter.